William R. Cox, M. D. is a native of Savannah Georgia. He attended the University of Georgia and graduated with honors in biochemistry. He completed his medical education at the Medical College of Georgia and then completed a residency in Internal Medicine at the University of Texas Health Science Center in San Antonio Texas. Four years of active duty as a major in the US Army Medical Corps included a Cardiology Fellowship at Brook Army Medical Center. Thereafter, he completed a research fellowship in Interventional Cardiology (angioplasty) at Emory University under the direction of Dr. Andreas Gruntzig, the innovator and pioneer of coronary angioplasty. 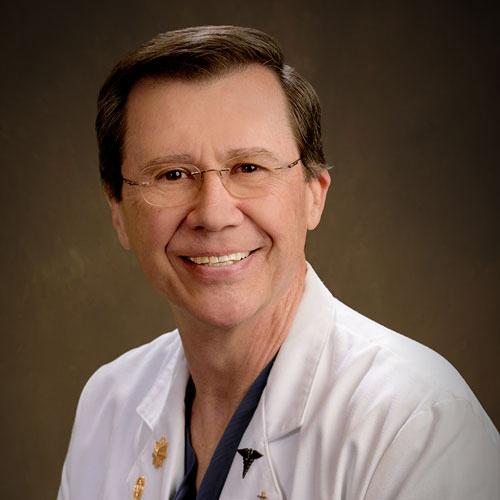 He is board certified in general cardiology and interventional cardiology. He is also certified by the Heart Rhythm Society as a cardiac device specialist. His main areas of interest are cardiac catheterization, coronary intervention, pacemaker/defibrillator implantation, and vein therapy. His outside interests include hunting and fishing and playing classical guitar. He and his wife Kimberly are avid cyclists and encourage everyone to “share the road”.